Join the Southam Heritage Collection and help support our work. Click here or on the picture for details. Want to help with our work? There are many possible ways you could contribute. Click here or on the picture for details. Starting on Tuesday January 8th we will have our first exhibition of 2019 open for you to come and visit. This exhibition will tell some of the story of the Southam Fire Brigade since its very start. The Exhibition will include a series of posters telling the stories of Southam’s firemen together with a number of items of equipment actually used by the local fire fighting team, including a real uniform, complete with helmet, axe and other items. 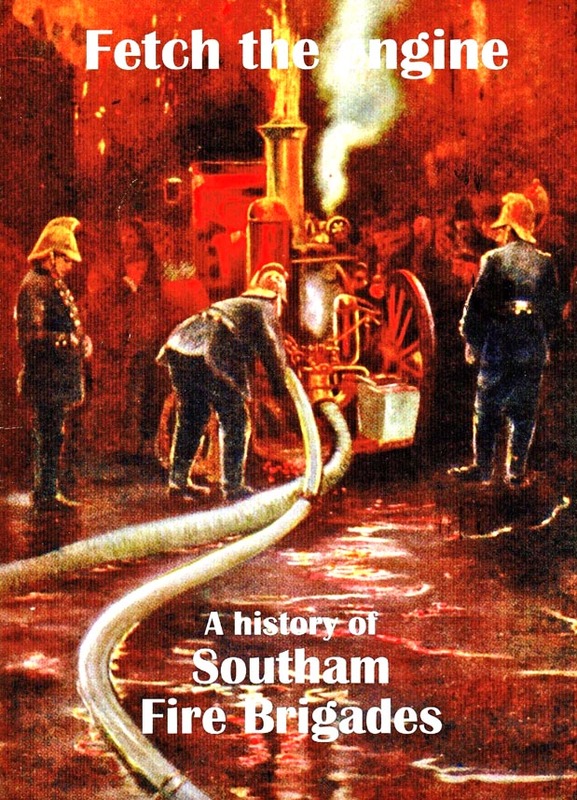 There will also be a video telling the history of fire fighting from Roman times and a book which you can purchase telling the story of Southam’s Fire Brigade written by Alan Griffin, a one time member of the local service. In addition children will be able to dress up in a fireman’s coat, gold helmet and belt, and have their picture taken wearing it, and find out what is in the History Detective Box! Tuesday, Friday and Saturday mornings 10:00 to 12:00 until May 21st. Contact us for group visits at other times. We have created an archive of stories – a Centenary Archive – which formed the basis of our major WW1 exhibition during 2018. 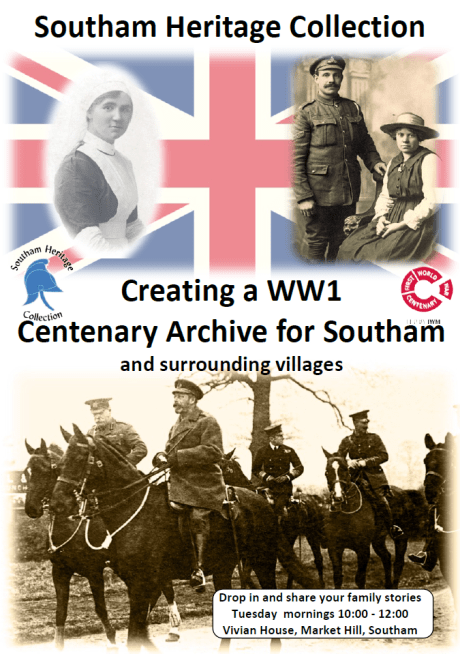 In the Centenary Archive we have included stories from people who had relatives living in and near Southam during WW1. Click on Southam VAD Hospital and WW1 Centenary Archive to view the results of our research. Contact Val Brodie for more information and to share your details or call in on Tuesday mornings between 10 and 12:00. One of the many benefits of moving the Heritage Collection into Tithe Place is that it is now almost impossible for residents and visitors to miss catching a glimpse of some aspect of Southam’s History. However, you may not have realised it is now possible to see three different displays, two of them whether our main exhibition room is open or not and one for 24 hours each day. 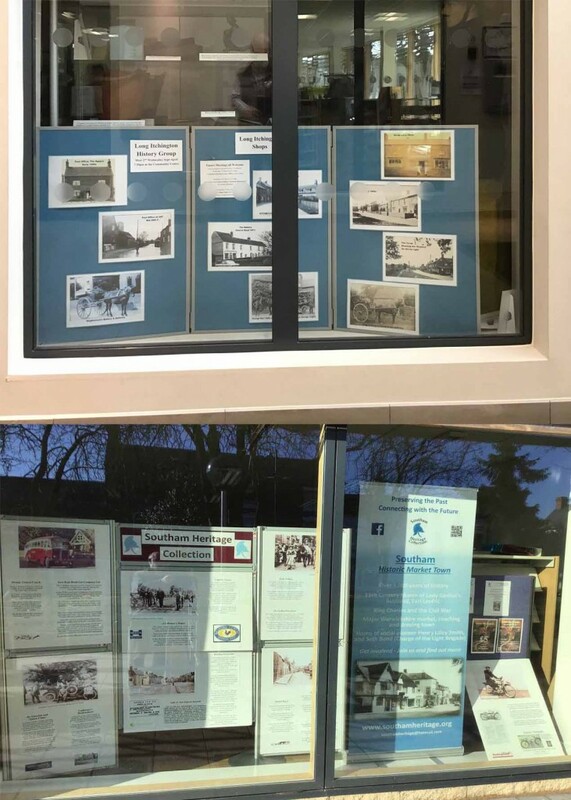 This is all possible because we now have two very large windows and we are using these to display completely different aspects of local history from that on display inside our Exhibition Room. These windows are in the Atrium passage way on your way to the Library, Café or Activity Room in Tithe Place, and on the outside of the building just on the right of the entrance. Currently this latter window is in a bit of a cul-de-sac walkway but it is easily visible even from across the road. We are aiming to change the displays in both windows on a 6 – 8 weekly basis (more frequently than our main exhibition) so there should always be something new for you to take a look at. The current (February) displays cover one of our new books “Alimentary Anecdotes” about local recipes in the Atrium, and fuller stories on some of the photographs from our 2019 Calendar in the external window. Our latest display in the Atrium window features the village of Long Itchington. Take a look at one or both windows next time you are passing. The Southam Heritage Collection is a charity (Registered No 1173033) dedicated to preserving and promoting the local history of Southam and the surrounding villages. It is the custodian of over 10,000 items including 6,000 objects, 3,500 photographic negatives and 450 glass plate negatives. The Collection receives no on-going support from any outside commercial or government body and is solely dependent on donations, grants, subscriptions and support from members of the public and local businesses to cover its running costs. If you can provide any support, either financial or skills, you would be most welcome. Support us at no cost! Yes, its true you can support us at no cost to yourself each time you purchase something from Amazon. AmazonSmile is a website operated by Amazon with the same products, prices and shopping features as Amazon.co.uk The difference is that when you shop on AmazonSmile, Amazon will donate 0.5% of the net purchase price (excluding VAT, returns and shipping fees) from your eligible AmazonSmile purchases. Just select Southam Heritage as your chosen charity. Why not join for the coming year? It’s only £5 for 12 draws with a £10 monthly prize and a chance of substantially more in November and May each year. Obviously the sooner you join the more chances you have each year of winning. Draws take place each month from June through to the following May. We would really value your support. Download a form to apply here. The 200 Club winner for the March draw is E Jamieson – Ticket No. 37. You can only win if you have a ticket – why not buy one now? Are you looking for a small present for someone that covers Warwickshire history? Take a look at these three books available from our Exhibition Room in Tithe Place.